HomeCinemaMasala‘Jab Tak’ from M.S Dhoni – The Untold Story is an ode to Saakshi-Dhoni Love saga! ‘Jab Tak’ from M.S Dhoni – The Untold Story is an ode to Saakshi-Dhoni Love saga! The new track from Neeraj Pandey’s M.S.Dhoni – The Untold Story, titles ‘Jab tak’ showcases Sushant and Kiara revisiting Dhoni-Saakshi’s courtship days. Director Neeraj Pandey, has left no stone unturned when it comes down to screening the untold story of Mahi’s life on screen and wanted it to be as real as possible. The filmmaker has shot portions of the film at real locations and has captured Mahendra Singh Dhoni’s journey from Ranchi to International cricket. Apart from the storyline, Neeraj has also ensured that the songs have a real connect. 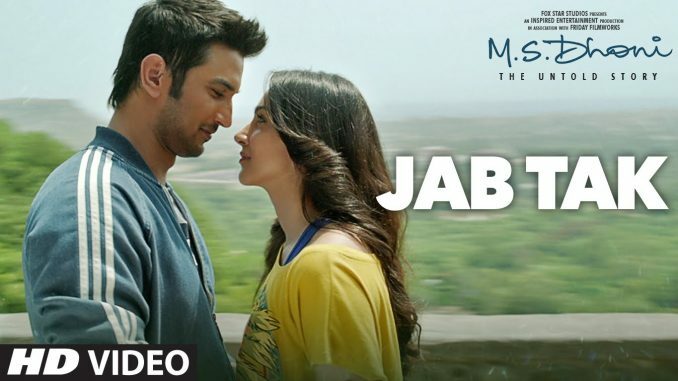 The track, ‘Jab Tak’, is the third song from the film featuring Sushant Singh Rajput and Kiara Advani, describes Dhoni’s romance with Saakshi (now his wife). The song was shot during the initial schedules in Aurangabad, the city where Saakshi studied hotel management. The track ‘Jab Tak’ appears in two versions in the film and is sung by Armaan Malik and composed by brother Amaal Mallik beautifully. M.S Dhoni – The Untold Story’s trailer crossed the benchmark and had millions of views in just a span of four days. The previous two songs released from the film were both breathtaking, ‘Besabriyaan’ was inspiring and an energized track where as ‘Kaun Tujhe was a soft romantic number. Helmed by ace director Neeraj Pandey, produced by Arun Pandey and Fox Star studios, the film which is one of the most anticipated films of the year is all set to release on September 30th, 2016. What Would It Take to Establish a Truly Free Market Economy? Baar Baar Dekho’s chart buster playlist calls for a celebration!